Fr Vladimir will be away in Russia from June 22 to August 31, 2006. During this time, there will be Readers services every second weekend starting June 25. Readers Vespers will take place every Saturday. Fr Roman will be serving a Divine Liturgy at St. Antonios on either July 2 or 23 (the date has not yet been confirmed) and on Sunday, August 27, at 11:00am. Fr Roman will be serving Divine Liturgy at St. Vladimir’s (Transfiguration) on Saturday morning at 9:40am; on Sunday eve (Dormition MG), Vespers will start at 4:00pm, followed by the Divine Liturgy. Personal appointments with the Bishop: Saturday afternoon November 11 from 2pm-4pm and also Sunday afternoon November 12 from 2pm-4pm (sign up sheet in the Synaxis room). Vespers: Saturday, November 11, 5:30pm, followed by a Parish pot-luck dinner and general Parish Meeting. 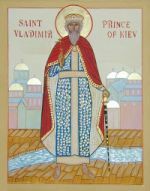 Divine Liturgy: Sunday, November 12, 10am, followed by a Parish lunch and socializing with the Bishop.